Aki Yashiro (八代亜紀), born on August 29, 1950 in Yatsushiro, Kumamoto Prefecture, is one of the greatest enka singer. Her stage name “Yashiro” is adopted from her hometown, “Yatsushiro” (八代). She originally sang jazz standards in hostess clubs. 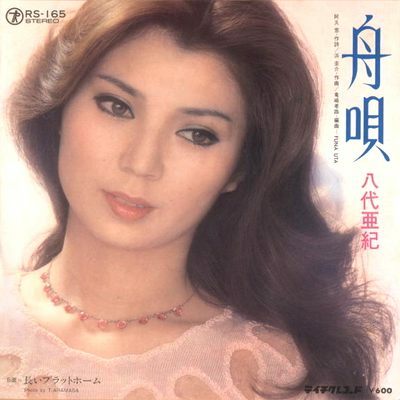 She made her debut as an enka singer in 1971, with the single “Ai wa Shindemo (愛は死んでも). Seeing the single’s unsuccess, she appeared on the YTV’s Zen Nihon Kayō Senshuken (全日本歌謡選手権) audition, winning it for 10 consecutive weeks ! 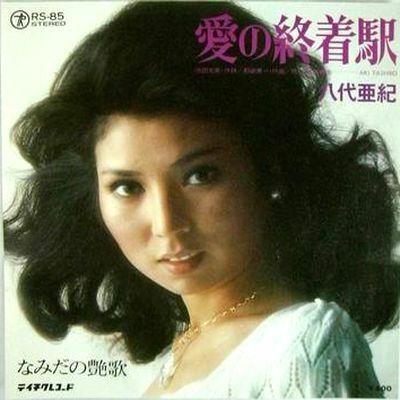 In 1973, her album “Namida Koi” (なみだ恋) sold up up to 1.20 million copies. Since then, her songs like “Shinobigoi” (しのび恋), “Onna no Yume” (おんなの夢), “Mō Ichidō Aitai” (もう一度逢いたい), “Ai Hitosuji” (愛ひとすじ), “Onna Minatomachi” (おんな港町), “Funauta” (舟唄) and “Ai no Shūchakueki” (愛の終着駅) also became great hits at the time.